The Salvation Army’s Indiana Service Extension is seeking a representative for the Wabash area. The representative will assist families in need of the organization’s services. He or she will help to decide which families will receive assistance and what kind of assistance is needed. The extension’s northern liaison, Major Gerald Smelser, hopes to have the volunteer position filled by the end of October. “It’s not a difficult thing, and they can do it on their own schedule,” said Smelser. For the youngest students in Wabash County, college is no longer simply something they imagine—it is a place they have visited and seen for themselves. On Sept. 27, every kindergarten through third grader in Wabash County visited Manchester University for a day full of activities and fun. 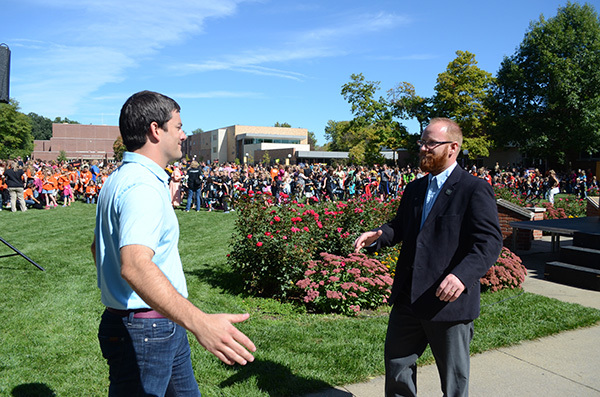 The community celebrated students’ dreams for the future at the “Walk Into My Future” event. The event and Promise initiative were successful thanks in large part to the efforts of presenting sponsor, Beauchamp McSpadden. The Wabash County Animal Shelter is making some changes, adding new services, while reinstating others that were not offered for a period of time. The shelter has adopted a new vaccination and testing policy, through which each animal that arrives at the shelter is tested for likely diseases. Cats are tested for Feline Leukemia Virus (FeLV) and Feline Immunodeficiency Virus (FIV), while dogs are tested for heartworm. Cats and dogs receive their respective vaccinations along with a one-year rabies vaccine, which both animals receive. Manchester Community Schools were named a $25,000 grant winner in this year’s America’s Farmers Grow Rural Education program. A ceremony took place on Oct. 11 at Manchester High School. America’s Farmers Grow Rural Education, sponsored by the Monsanto Fund, offers farmers the chance to nominate a local public school district, which will compete for a grant of up to $25,000 to enhance math and/or science education. More than 1,150 nominated school districts submitted applications. The Monsanto Fund will invest $2.3 million through America’s Farmers Grow Rural Education grants this year. Manchester Community Schools faculty, local farmers and Monsanto representatives participated in a check presentation ceremony before kickoff at the homecoming football game. America's Farmers Grow Communities, which offers winning farmers the chance to direct a $2,500 donation to a nonprofit organization in their county, is also part of this effort. To date, these programs combined have contributed more than $15 million to rural communities. To learn more about either program, please visit americasfarmers.com. Mark your calendars for North Manchester’s most memorable night out on the town. Manchester Main Street’s 2nd annual “Light up the Town” Holiday Gala will be held on Friday, Dec. 6, from 6 p.m. to 11 p.m. This progressive dinner event will feature specialty treats from North Manchester’s finest restaurants, bars and entertainers. Four historic downtown venues will be transformed into holiday splendor, and filled with live music, dancing and silent auction treasures. In his new book on Christian theology, “The Road Back,” Wabash author Rick Tolley offers refreshing lessons to draw Christians even closer to God and re-ignite the love that Christians might have lost. Many today are searching for relevance of the Christian life. In “The Road Back,” Tolley challenges those who are wrestling with the Christian life to think outside the box. With a unique look at how the Christian life fits into the world today, he uses stories and analogies that will challenge the readers’ thinking. His plain and simple approach challenges them to grow deeper in their walk with God by going outside traditional, religious thinking without compromising God’s Word. 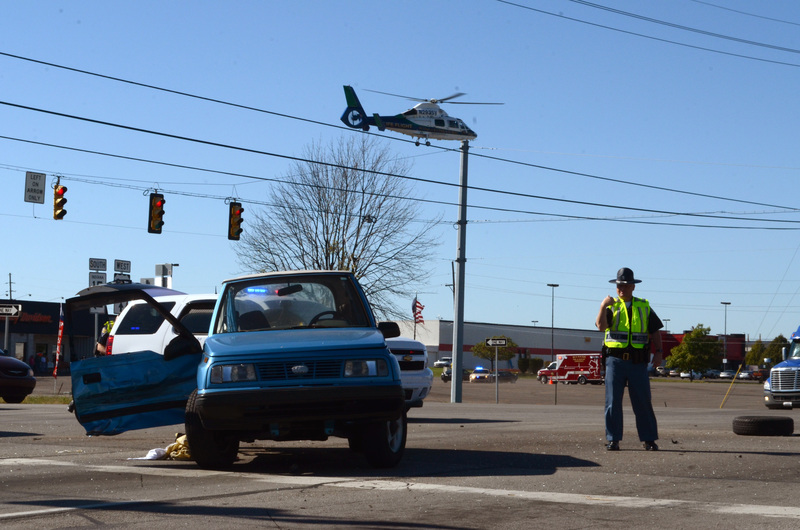 A serious accident occurred at the intersection of 24 and 15 just before 3 p.m. on Wednesday, Oct. 9. A light blue Geo Tracker, driven by Markeeta M. Webb, 71 Huntington, collided with a black Chevrolet Silverado, driven by Charles C. Smith, 62, Martinsville. The Wabash Police Department stated that Webb turned left from westbound US 24 onto southbound SR 15 when Smith, who was headed eastbound on US 24, struck her vehicle.